Welcome to The Boxing Bulletin's live blog coverage of Showtime's bantamweight clash between Joseph Agbeko and Yonnhy Perez. Round by round updates should start at approximately 10 PM EST, but check back in with us earlier in case Showtime's opening bout ends quikly. 8:55 PM EST... Round by round coverage will start with the main-event. I'll post the occasional update of the DeMarco/Alfaro bout. 9:19... We're through 2 rounds of DeMarco vs Alfaro and DeMarco is in control. He's keeping Alfaro at range, and started to really unload with some hard power shots in the last minute of the 2nd. 9:31... Through 5, it's mostly all DeMarco. Occasionally Alfaro gets through with something, but it's a pretty one sided fight so far. 9:40... We're now in round 8. DeMarco firmly in control. 9:46... All 3 judges on press row have it 80-72 for DeMarco. Round 9 is winding down. 9:51... DeMarco puts Alfaro down 3 times in the 10th, and this one's over. 9:52... A big right hook started things off for DeMarco. It sent Alfaro almost through the ropes, and he never recovered. 9:54... Official time is 2:07 of the 10th round. 9:57... The official judges had it 90-81, 89-82 and 89-82. 10:00... Jim Gray is with a cheerful Mike Tyson and Don King. He just asked Mike if there's any chance of a comeback. Mike's answer..."I'm too fat." Don's got a big grin on his face. 10:05... Al Bernstein and Steve Albert are chatting about the Super Six. Hopefully we'll be seeing Agbeko and Perez shortly. 10:11... Yonnhy Perez is making his way in. 10:13... Here comes Agbeko. He's playing up the Halloween theme, as he follows a stunning blonde who I assume is supposed to be Ann Darrow to the ring, while wearing a King Kong mask. 10:16... Jimmy Lennon Jr. with the intros. The ref is Robert Byrd. 10:19... Final instructions are being given. We're moments away from starting. 10:22... Here we go. Both guys immediately begin trading in the middle of the ring. Agbeko's told to watch his head. Both guys unloading, although it's Agbeko's who's appearing to be winning these early exchanges. He's letting both his hands go, and going hard to the body. Al comments that it's not the best idea for Perez to lay on the inside with Agbeko. 1:30 to go. Action in the middle of the ring. Perez is standing in and firing back. He's landing some decent counters. Heavy leather being traded here. Agbeko is sticking the jab, and then firing hard shots, but Perez just landed a nice hard counter left hook. And he just landed another one. Some great action towards the end of what was a very good round. 10:23... That was a hell of a round. Impossible to give a blow by blow, as there was just so many clean shots landed. Just hard intense action. 10:27... Agbeko is pushing forward, but he's not backing Perez off. "The non-stop punching continues." - Steve Albert. Just some terrific exchanges here. Agbeko is pushing the action, but Perez is landing hard counters. None of them are backing Agbeko off though. It's just relentless stuff. Agbeko just ate another hard counter, but he just keeps pouring it on. 1:30 to go. Right now, I'd say Perez is landing the cleaner more precise stuff. Agbeko just landed a hard right hand on the button, but Perez took it without blinking. Agbeko with another hard right hand. Perez again took it very well. Perez is standing in and ripping counters in return. Perez with a hard right hand that Agbeko takes well. Both fighters just unloading. Al comments that he's never seen Perez' left hook look so good. Another good exchange before the bell. Through round 2, this is fantastic stuff. 10:27... Both these guys are showing very good chins, as they've traded bombs so far without showing much effect. 10:31... Round 3... Agbeko again comes forward trying to press the action. He just landed a nice hard combo, but Perez stands right in there on the inside and fires back. Now Agbeko with a hard left hook. Agbeko with a solid right. Agbeko having the better of things here early in round 3, but he eats a counter left hook. "Can these guys do this for 12 rounds?" - Albert. I can't imagine that they can. Somebody has to crack under this kind of heat. Agbeko just ate a hard right hand, and immediately fired back. Agbeko with a right hand. Agbeko just landed another really nice right hand that seemed to snap Perez' head back, but he took is well, and he's back throwing immediately. 50 seconds left in the round. Big left hand from Perez! And Agbeko immediately fires back. This is terrific stuff. Good body work as well. It's hard bruising action. "What I love about this fight is that technique has not gone out the window." - Al Bernstein. There's the bell. 10:34... Round 4 is underway. As usual it's Agbeko pressing forward and taking the lead, but with Perez standing right in and firing back. Press row has it 29-28 accross the board for Perez. Al agrees. No let up here in round 4. Both men standing in the middle of the ring and unloading on the inside. 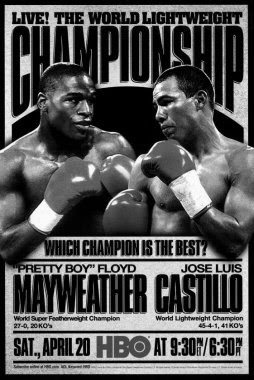 It's very much like Castillo/Corrales 1. Agbeko is using his jab a little more now. I think he'd be wise to slow things down a little. He's also jumping in with lead rights. The last minute has been fought at a quick pace, but not really the same quantity of power shots exchanged. Agbeko is now backing Perez up a little, but he's getting countered in the process. More heavy body shots exchanged. Both fighters going downstairs well. There's the bell. 10:38... Round 5. Action in the middle of the ring here to start the round. Now it's Perez pushing Agbeko back, and it's Agbeko responding with a hard right hand, as he gets off the ropes. Action back in the middle fo the ring. Agbeko banging the body in close, and he's warned to keep his shots up. He's trying to use some more head movement, rather than recklessly trading here. Now he comes forward, unloading as he backs Perez on the ropes. He landed a hard left hand during that sequence, which Perez as usual took very well. Perez came firing back as he quickly got off the ropes. 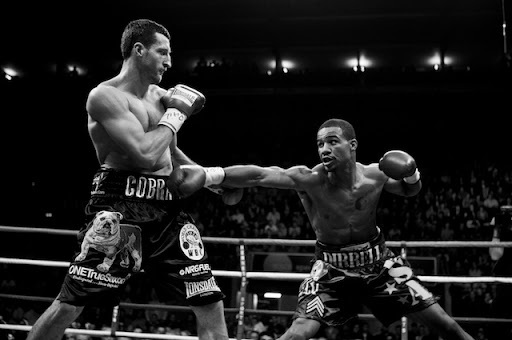 Agbeko again drilling the body hard, and he's again warned by Robert Byrd to keep them up. Al says those were marginal and he hopes those warnings done stop Agbeko from going downstairs. He just landed a nice right hand. More good exchanges as the round ends. It might be my imagination but I think Perez is slowing down just a touch. 10:43... Al thinks Agbeko's body work was the difference in the 5th. Agbeko is sticking the jab here early in the 6th. He's landing it through Perez' guard. Perez is looking to counter with his left hook. Now Perez comes forward and bangs the body hard. Perez with a nice right hand. Action in the middle of the ring. Perez with a nice 1-2 combo. Perez with another combo. Perez with a hard right hand. A good sequence here from Yonnhy Perez. Agbeko keeps coming though. A hard exchange with both men getting through with power shots. Both using their jab here, and Perez landed a nice counter right. 45 seconds left in the round. More bruising stuff from both fighters. Agbeko with a nice upper-cut on the inside. Now he bangs the body with a hook. 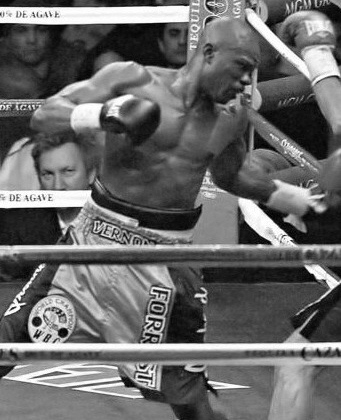 Agbeko pushes Perez back to the ropes, but Perez slips away back to the middle of the ring. There's the bell. 10:43... That was a solid round for Perez, although Agbeko came on strong at the end of the round. 10:46... Perez suffered a cut in the 6th due to an accidental clash of heads. Not sure how bad it is. Agbeko's started quickly here in the 7th. He's going hard here in the first minute, backing Perez up with some hard shots. Press row has it 58-56, 58-56 and 57-57 for Perez. Al has it 57-57. So far Agbeko is having a very good round. Perez is now standing his ground though firing back. "Amazing pace to this right." - Albert. Al thinks Perez's shots are lacking a bit of steam compared to the last round. Action in the middle of the ring as usual. No clinches in this one. Just a lot of hard exchanges. Al again mentions that Perez' shots aren't quite as sharp, that he's pushing a little with his punches. There's the bell for round 7. 10:47... We just saw a clip of Agbeko landing his head on Perez' jaw in the 7th. Maybe there's no holding in this one, but it's certainly not all clean. 10:51... Action in the middle of the ring here in round 8. The action is a little sloppier here in this round. Agbeko suddenly seemed bothered by something, and started backing up and Perez chased him. Now Agbeko fires back, but he's got his back along the ropes. Now he tries to hold on. Now Agbeko fires back with a right hand. "Just went you thought Perez was on the downslide, he comes back." - Al commenting on a good round so far from Perez. I'm having trouble keeping up with the blow by blow here. Some heavy exchanges in the middle of the ring, with Perez landing a hard right hand that was the best shot during that sequence. Now Agbeko comes back, pushing Perez into the ropes and unloading. "Unbelievable action." - Steve Albert. It's really too good for me to properly capture. 10:55... Round 9. Action in the middle of the ring. Both letting their hands go. Now Perez pushes Agbeko back, and AGbeko responds by backing Perez off. Action back in the middle of the ring. Now Perez with a nice combo that backs Agbeko off momentarily. Perez with a good stretch here, as he's again landing the cleaner shots. Press row has it 77-75 for Perez twice, and 77-75 for Agbeko. Al has it 76-76. Action in the middle of the ring. Agbeko with a good sequence now, as he lands a couple good right hands. I think both men are a little fatigued. Now quite the same sharpness from either as we saw earlier. It's been a grueling battle of attrition. More good action, as Perez landing some decent counters only for Agbeko to push him back, and then for Perez to fire back. Agbeko with a couple decent rights near the end of the round. 10:59... Round 10. 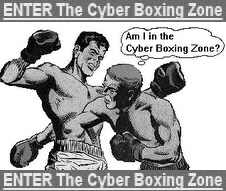 The fighters immediately start exchanging in the middle of the ring. Both are warned for using their head, although I think that's clearly something Agbeko is initiating. Al comments that Perez' left hook is not the weapon it what earlier in the fight. It's a little wider. Agbeko is the one pushing the action in this round and having the better of it. He's catching Perez with hard shots, and then Perez fires back with a hard right hand counter that landed flush. Agbeko keeps pressing through. Perez fires back with another nice counter. Agbkeo pushing forward. Perez maybe taking a breather, or a little tired. Agbeko using his jab well in this round.Something happened to Agkbeo's eye, and he turned around and then got clocked by Perez. He's up quickly. I think there might have been a clash of heads, but Byrd missed it. That will count as a knockdown. Agbeko fires back as the round ends. Let's see that again. That could be a huge moment when it comes to the scoring as that was a very good Agbeko round up to that point. 10:59... 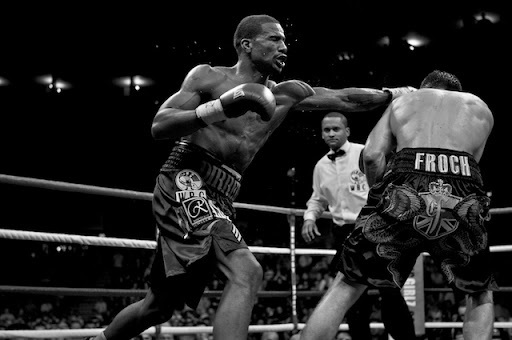 There was a clash of heads, and Agbeko immediately turned, and Byrd didn't see it as he was on the other side of the action. 11:03... Hard intense action here to start round 11. Both men exchanging in the middle of the ring. All 3 judges have Perez up. 2:00 left in the 11th. Good exchanges here in the middle of the ring. Agbeko I think having the edge in these exchanges, but Perez is landing his share of counters. Just intense action on the inside. Both men just ate hard left hands. Agbeko pushing Perez back a little, but Perez landing counters, and now works his way off the ropes. Terrific round from two tired, but very determined fighters. 11:07... Both men immediately start exchanging in the middle of the ring. Agbeko with a big left hook, and Perez took it well, and he comes back with a hard right hand on the button. Great exchange there. Al says he'll be shocked if the judges have it more than a point or two either way. Al has Perez up by 1. 2:00 to go here in round 12. Ferocious action in the center of the ring. This is amazing stuff. Agbeko having a bit the better of it, with his right hand. Perez is firing back and landing though. "What a sensational fight." - Albert. 50 seconds left. Now they have slowed just a touch, as Perez backs away for a second. Agbeko goes after him, but he's tired. 20 seconds left. Both fighters clearly tired here. They have given a hell of a lot. There's the bell. What a fight. 11:09... We await the cards. 11:10... Here's Jimmy Lennon with the result. 116-111, 117-110, 117-110 all for Yohhny Perez. 11:11... I'm very surprised at those scores. I thought it was razor close. 9-3? 11:12... Jim Gray is with the two fighters. 11:18... Not surprisingly, Agbeko wants a rematch. I'd love to see it. That was a hell of a fight. For sustained action, I don't think there was a better one this year. 11:19... Press row had it 116-111 and 115-112 for Perez, and 114-113 for Agbeko. 11:20... All 3 press row judges and all 3 official judges obviously scored the knockdown round 10-8. That's just lazy scoring. A knockdown does not automatically give a fighter a 10-8 round, especially if he clearly lost the majority of the round. Anyway, I don't want to complain too much, as that was a fantastic fight, and I think Perez was a fair winner... but I really can't see it being nearly that wide. I hope you enjoyed our coverage of the fight, and check back next week for our live round by round coverage of Glen Johnson vs Chad Dawson. Carlos Acevedo previews tonight's Showtime main-event between Joseph Agbeko and Yonnhy Perez. Bruising Joseph “King Kong” Agbeko looks to continue his recent tear when he defends his KCRW bantamweight title against undefeated Yonnhy Perez tonight at the Treasure Island Casino in Las Vegas, Nevada. Both fighters are coming off of grinding scraps and it is likely that this bout will be no different. In fact, a brawl seems all but guaranteed. Agbeko, 27-1 (22), upset Armenian Wildman Vic Darchinyan via decision in July and Perez knocked out Silence Mabuza last May in the final round of a fight he was losing. 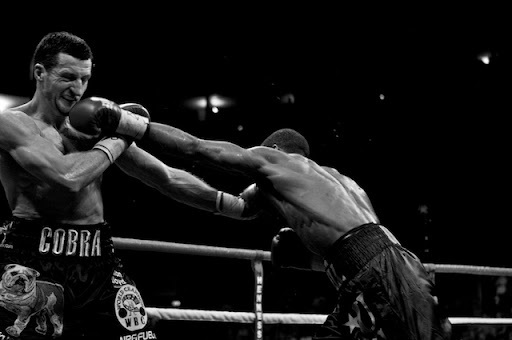 Despite smacking Darchinyan around in an ugly affair, Agbeko does not appear ready to assume a spot in the International Boxing Hall of Fame. Darchinyan, briefly on the revolving door carousel of several dopey “P-4-P” lists, was not as good as his cyber clippings suggested and there is the possibility of overrating Agbeko based on his performance against a fighter who throws punches like a man suffering from ergotism. His attributes—-stamina, hand speed, athleticism, and durability--are nearly equally counterbalanced by his flaws: a tendency to square up, poor balance, and negligible defense when on the attack. Still, Agbeko must be considered a proven commodity at this point, while Perez, 19-0 (14), has talent but perhaps does not yet have the resume to compete on the highest levels. 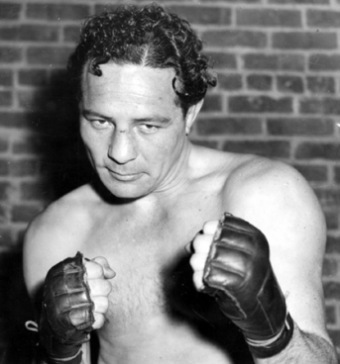 Compared to Vic Darchinyan however, Perez with his fluid combinations and amateur pedigree, resembles Benny Leonard. 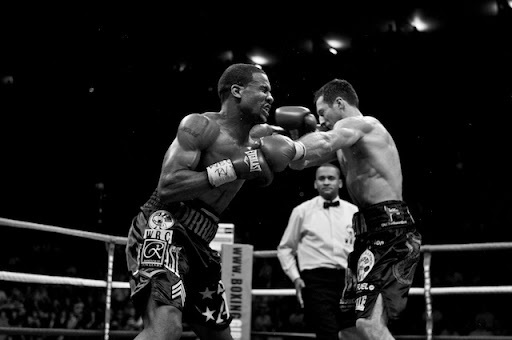 Agbeko, the Bronx via Accra, Ghana, will not be able to stymie Perez from the perimeter the way he did Darchinyan. On the outside Agbeko likes to nod, dip, and feint before rushing in with hard shots. He is fairly quick and often uses his speed to throw unorthodox punches, like perplexing double lead rights. For some reason this arcane weapon is a favorite of West African boxers based out of the South Bronx. Its delivery, which resembles that of a quarterback double-pumping, often leaves its hurler off-balance and susceptible to counters. Joshua Clottey also uses it regularly, as does Anges Adjaho, originally from Benin, but now living in upstate New York. In addition, Agbeko tends to square-up when on the attack with wide punches and Perez should be able to thread straight rights down the middle. Darchinyan could never really catch Agbeko coming in because Darchinyan, like a tipsy javelin thrower, often needs a running start before letting his arcing blows go. Oddsmakers have installed Agbeko as the favorite. He is stronger, hits fairly hard, and is more experienced. To top it all off, his awkward style means trouble for anyone who steps in the ring against him. So what will it take for Perez to swing an upset? First, he will have to add some angles to his game; stationary targets allow Agbeko to get away with hurling junkballs all night; Perez has shown a talent for slipping punches here and there, but he needs to add footwork to keep Agbeko off-balance. Second, Perez has to try to break Agbeko down to the body. There were moments against William Gonzalez when Agbeko, 29, looked visibly distressed after taking some thumpers to the ribs. 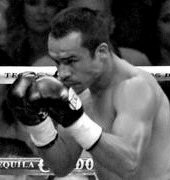 It is up to Perez, who holds slight height and reach advantages, to consistently attack the body while throwing combinations. Eventually, Agbeko will be forced to give ground and Perez will go to work with straight rights and his relentless left. If Perez, 30, can manage to force Agbeko to fight on his back foot he will have an edge. Finally, Perez has to avoid headbutts and make Agbeko pay when he rushes in without caution. For his part, Agbeko will have to replicate his fight with Gonzalez and kick up a fuss for all three minutes of each round. 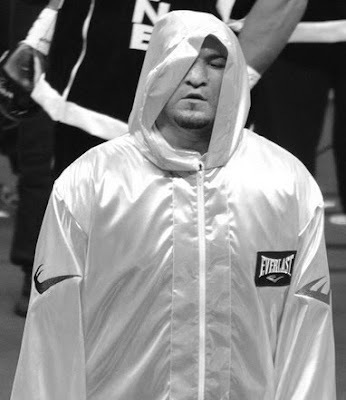 His tendency to reach when punching will be a liability against a precise sharpshooter like Perez, but his experience and chin will help him through some hard times. If Agbeko can make the fight a roughhouse affair he should be able to outwork Perez, who does not have the slickness to outmaneuver Agbeko on the inside. Perez is the more skilled fighter and throws snapping punches accurately and in combination. His left hand is particularly effective. To offset these strengths, Agbeko might have to turn into a grinder in the clinches and throw some junk at his opponent. Agbeko does have some clever moves--including a heat seeking missile of a forehead and a nifty shimmy--and will probably empty his entire bag of tricks or treats in order to unsettle Perez. It is not clear whether Perez, given his relative inexperience, can hold up under a sustained assault. Judging from his dramatic KO of Mabuza, Perez, Santa Fe Springs, California via Cartagena, Colombia, is not the kind to wilt under pressure. 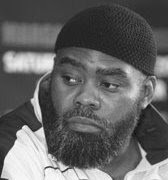 He was behind on the scorecards when he lowered the boom on Mabuza and never looked discouraged despite the fact that he was down on points against the toughest opponent of his career. 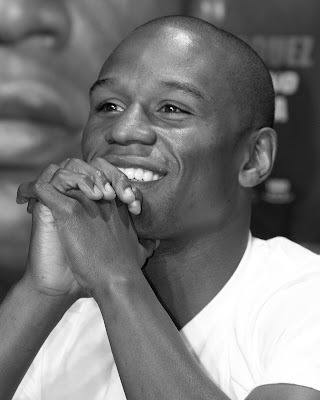 That poise, more than anything, is reason to like his chances against a fighter as careless as Agbeko often is. If Perez stays busy, attacks the body, and keeps Agbeko on the perimeter with his snapping jab, he might be able to pull off the upset. In order to outpoint Agbeko--since a knockout seems unlikely--Perez will have to maintain his composure and fight with discipline. Of course, Agbeko will have his say in the matter, and will be there clawing until the final bell. Perez via close decision in a fight that can go either way. For more from Carlos Acevedo, check out his blog, The Cruelest Sport on the MVN network. Read more! Dave Oakes previews Friday's British super-middleweight title fight between Tony Quigley and Paul Smith. Tony Quigley makes the first defence of his British super-middleweight title on Friday night in an eagerly anticipated all-Scouse clash against Paul Smith at the Echo Arena, Liverpool. The fight has generated a lot of interest on Merseyside and has nearly sold out the 10,600 capacity arena. The fact that there seems to be a bit of needle between the pair has only added to the high profile nature of the build up around the Liverpool area. Personally, I’m unsure as to how much genuine bad blood there is between the two, I get the feeling a lot of it has been done to help the promotion. I do feel there’s a fierce rivalry between the combatants but not to the level it’s been built up to. The supposed bad blood started when Smith did a radio interview in the build up to Quigley’s fight against another Scouser, Tony Dodson. Smith claimed that that he could knockout both Quigley and Dodson on the same night and went on to describe Quigley as a “never will be”. Quigley responded by beating Dodson to win the title and will now get the chance to prove once and for all who the best super-middleweight in Liverpool is. Quigley, 13-1 (6KO’s) was exceptional the night he beat Dodson. He started the fight in fine style by dropping his rival in round two; he then had to survive a ferocious comeback from Dodson as the fight wore on before a gargantuan effort from him late on helped him to a 12th round stoppage win. Quigley showed a bit of everything against Dodson, he boxed well in parts, brawled at other times, took some heavy shots, dug deep when he needed to and showed great finishing instincts. It’s even more impressive when you take into consideration that he took the fight at two weeks notice despite never going beyond six rounds before. 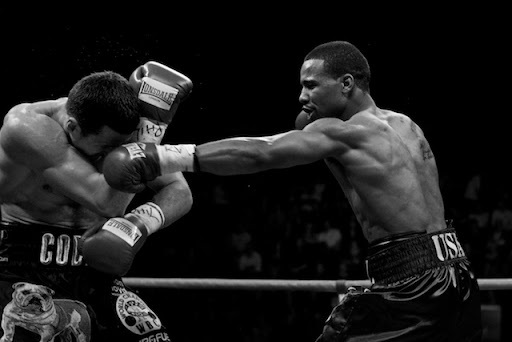 Before the Quigley-Dodson fight, Smith was the much better known boxer. He was a top class amateur and received a lot of attention when he participated in the American show The Contender. Smith left the show after just one fight having sustained two bad cuts in his points victory over David Banks. 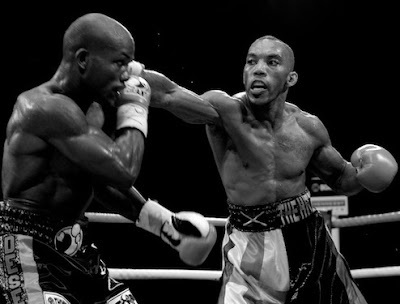 Smith, 27-1 (15KO’s), is the more experienced fighter, as well as his victory over Banks, he holds wins over the heavy handed Cello Renda and onetime world title challenger Jonathon Reid. Smith also had an extensive career as an amateur, boxing all around the world. 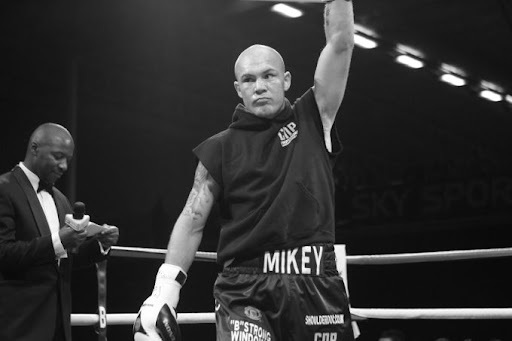 The high point being when he won the silver medal at the 2002 Commonwealth Games, narrowly losing in the final to Jean Pascal, the current WBC light-heavyweight champion. Despite his amateur experience and high profile, Smith has yet to reach the level that was expected of him when he turned pro. His career has never really got going and I get the feeling that this title shot has come at the perfect time for him. Quigley has a slight advantage in terms of skill and speed but Smith is definitely the puncher in the fight. Smith can be a skilful boxer himself when he applies himself but at times in the past he’s let his heart rule his head and has ended up brawling more than boxing. I feel the early rounds will be vital; Smith needs to stamp his authority on the fight as soon as possible and try to hurt Quigley. I think Smith will go to the body early, he’s a noted body puncher and Quigley has shown he’s susceptible to body shots before, particularly in the only defeat on his record against Nathan Cleverly. I believe Quigley will look to box early on before standing his ground more as the fight goes on. If he can outbox Smith early, and avoid taking the energy sapping body shots, I feel he’ll come through a tricky moment or two to claim a narrow points victory. With Chad Dawson and Glen Johnson set to renew hostilities on November 7, I thought it would be a good time to look back and score their original meeting. It's been awhile since I saw the fight, and as it was one of my favorites from last year, I decided to just watch and enjoy it first while taking a few notes - then carefully score it on my second viewing. -- My prediction going into the fight was a one sided Dawson victory. 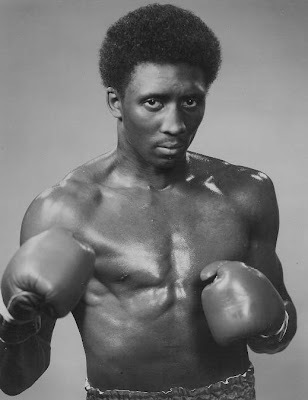 Johnson had been doing battle with fellow old timers Antonio Tarver, Clinton Woods and Montell Griffin and my feeling was that his age would really show when matched up with a young fighter of Dawson's class. I thought Dawson would be too quick and too sharp, and while he was quick and sharp, I was very wrong about Johnson's ability to still bring it. -- After watching some of the messy foul filled scraps in recent weeks, it was a pleasure to see such a clean hard fought fight. Holding? None. Dirty fouls? None. Just two high caliber fighters going at each other. I can't wait for November 7. If Johnson hasn't suddenly got old, we're in for another treat. Fast paced round, that Dawson took hold of over the last couple minutes. He landed his jab, and his straight left, and threw some nice combos. While Johnson was outworked, he managed to successfully close the gap, landing his right cross, as well as some nice shots to the body – but still found it difficult to unload thanks to Dawson’s impressive combos getting their first. Could it have gone the other way? No. Easy round to score. Score 10-9 after 1 for Dawson. I thought Dawson just edged the round, but not without a fair bit of trouble. He moved nicely, and picked his spots to plant his feet and rip combos, but Johnson still managed to wade through it all, closing the gap, and landing what I thought were the heavier punches - just not enough of them to win the round. Could it have gone the other way? You can make an argument for Johnson as his shots appeared to be heavier, but I don’t think he landed enough of them to really make a solid case. Score 20-18 after 2 for Dawson. Dawson started nicely, using his jab and creating some distance, but Johnson eventually got inside and made his pressure pay off with a very strong final minute. He landed some damaging right hands – including a couple in the final 10 seconds that had Dawson in a little trouble. Could it have gone the other way? No. Despite Dawson’s early edge, the damage Johnson did over the final minute was significant, and clearly outweighs Dawson’s work over the first couple minutes. Score 29-28 after 3 for Dawson. I had Dawson slightly up after the first minute, but Johnson then came on very strong in the middle, landing the most damaging shots of the round with his right hand. Dawson took them well though, and got back to boxing, outworking, and out-landed Johnson in the final minute, but even during that period, Johnson still got some hard shots through. 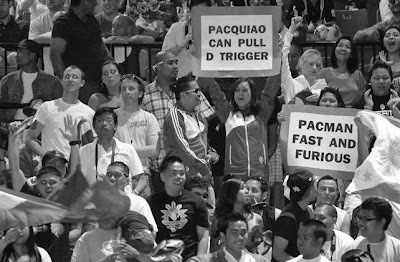 If forced to pick a winner when it’s this tight – it comes down to what you prefer, the fighter landing more frequently or the fighter landing with more force – and I prefer force. Could it have gone the other way? Yes. You can make a solid argument for Dawson. And I'd have no complaints with scoring it 10-10. I’ve got it even at 38-38 after 4. After some some fast paced nip and tuck action, Johnson took over down the stretch landing a number of hard power shots, including a really nice left hook late. Dawson had his moments, but wasn’t setting his feet and ripping combos the way he was earlier in the fight. He’s pecking more with his jab from range, and not throwing with the same authority, while Johnson is commanding his space, steadily moving forward and landing the harder shots. Could it have been scored the other way? No. It was razor close through the first couple minutes, but Johnson closed very strongly and convincingly took the round. For the first time in the fight, Johnson’s up on my card – 48-47. Very little meaningful shots landed this round, as Dawson made a concerted effort to stem Johnson’s momentum by avoiding exchanges in favor of boxing and moving. Johnson landed a few nice body shots, but for the most part he found himself unable to get close enough to let rip, while Dawson landed enough jabs and left hands to take the round. Could it have been scored the other way? Dawson didn’t do a whole lot, but Johnson just didn’t land enough to make a solid case. If half point rounds were an option, this would be a prime candidate. After 6, I’ve got this one a draw, at 57-57. Dawson built on what was working last round to keep Johnson at a comfortable distance, but added a bit more offense. He had a very nice stretch in the middle of the round, where he caught Johnson coming in with some sharp shots. Johnson had a few good moments in the last 30 seconds, but so did Dawson, who looked like he’d got some of the confidence from earlier in the fight back. Could it have been scored the other way? No. Dawson’s back in front, 67-66. This was a closely fought round, that I needed to watch an extra time before making my mind up. Both fighters worked hard and landed their share, but I felt that Dawson was doing the better work. He was just landing a little more, and a little cleaner. Could it have been scored the other way? Yes, this was definitely another candidate for a 10-10 round. Considering I gave the previous really tight one to Johnson, giving this to Dawson evens it up. Not that I’m trying to even it up – but just pointing out that at this stage, I don’t think either man has been given any breaks on my card. Dawson’s now got a bit of a cushion, up by 2 points, 77-75. Johnson came out strong, and had some good moments early – landing several hard shots over the first minute. I thought he had a slight edge over the next 60 seconds as well, before Dawson started putting things together towards the end of the round. Could it have gone the other way? Not in my opinion, but I should mention that at the midway point of the round, Al Bernstein and Steve Albert seemed to think the round was very close - and you can make an argument that Dawson had the edge the rest of the way. After 9, I’ve got it 86-85 for Dawson. Dawson was doing very nicely, until he got hurt with a looping right hand with about a minute left in the round. Johnson pressed his advantage, landing a number of solid shots over the final 60 seconds in what was the best period of the fight for either man. It must be said that while Johnson won the final minute big, Dawson fought back gallantly during Glen’s assault. Could it have gone either way? No. Johnson’s onslaught over the final minute easily won him the round. We’re back even on my card, 95-95. This was a hell of a round, with Albert proclaiming half way through that it was "Vasquez-Marquez...only bigger." Maybe we didn't see the same kind of sustained violence as with those little warriors, but this was a terrific round in a very good fight. Johnson just landed the harder, more effective shots and enough of them that even though Dawson had a gutsy rally at one stage, it wasn’t nearly enough to turn things in his favor. Could it have gone either way? No. Johnson’s back out in front, 105-104. Good steady work through the full 3 minutes from Johnson. Dawson had a couple decent moments in the middle of the round, but for the most part looked like he was content to play it safe until the final bell. Could it have gone either way? No. This was one of the more one sided rounds of the fight. After 12, I’ve got Johnson winning 115-113. Somehow, all 3 judges had it 116-112 for Dawson. I’ll be blunt. Those are garbage scorecards. Okay, so Dawson up by 4 points is out of the question, but can I see an argument for him winning the fight? Going over my card, there are 2 rounds which I think are really questionable – rounds 4 & 8. I gave Johnson round 4 and Dawson round 8. Giving both to Dawson, makes it 114-114. Rounds 2 and 9 were also reasonably close. I gave round 2 to Dawson, and round 9 to Johnson. Could Round 9 have gone to Dawson? Maybe, but I think if building a case for switching one of those rounds, I'd be able to do a better job for Johnson in round 2. So yes... it's possible to have Dawson up 7-5. But, I think when a fighter is commanding the space, backing his opponent up, landing the heavier punches, hurting the other man... to give the other guy the benefit of the doubt in all close instances is questionable. Even giving Dawson every close one, that's still only 115-113. How those judges came up with 116-112 is crazy. I'll say it again (with caps for good measure) those were GARBAGE cards. 115-113 for Glen Johnson. Maybe a draw. That's how I saw it. Now bring on the rematch! e-mail Andrew Fruman Read more! Dave Oakes recaps this past Friday night's Sky show. 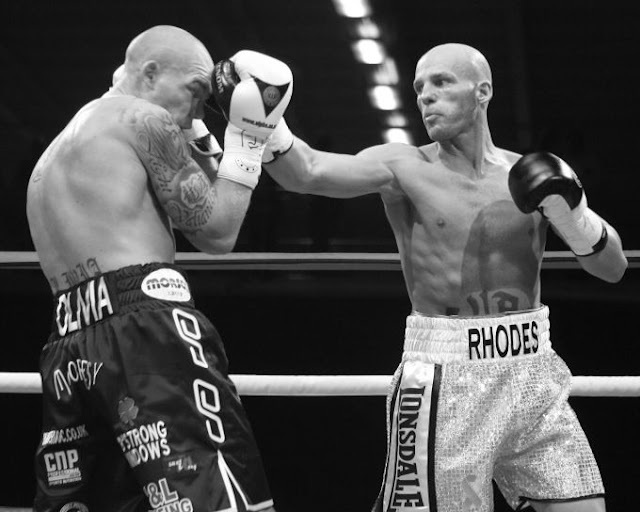 Ryan Rhodes became European champion on Friday night after stopping Jamie Moore in the seventh round of a classic domestic fight. Rhodes was a massive underdog going into the fight but out-toughed the usually teak tough Moore to claim the win of his career. Moore started the fight well, repeatedly catching Rhodes with hooks to head and body in the opening round. Moore continued the onslaught in the second round, he was beating Rhodes to the punch and was landing some hurtful body punches, a couple of which seemed to have an effect on Rhodes. The Sheffield man responded well to the heavy shots he was taking, firing back with his punches that made Moore think before he charged in. Rhodes was expected to make full use of the ring whilst countering the aggressive Moore; instead he seemed intent on standing his ground and taking on Moore at his own game. This didn’t seem like the brightest of ideas, especially after the third round in which Moore teed off on him from start to finish with powerful combinations to head and body. At the start of the fourth, it looked like it was a case of when could Moore get the stoppage, not if he could get the stoppage. There mustn’t have been many people in attendance who could have foreseen what was to happen. Yet again Moore was the aggressor, he was seemingly far too big and strong for Rhodes to cope with. 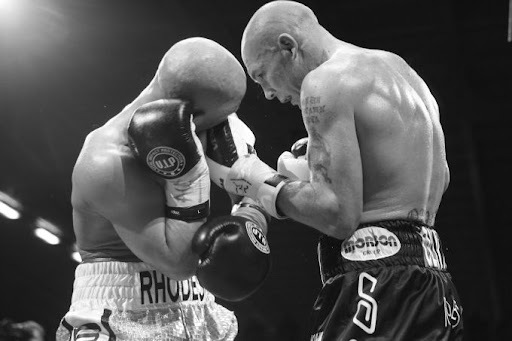 Rhodes was battling bravely and was having his own successes at times but Moore was landing some telling blows, in particular a left hook that rattled Rhodes’ jaw and visibly hurt the challenger. It was Rhodes though who landed the best punch of the round; he landed a vicious hook under the ribs bang on the bell that had Moore wincing and gasping for air as he made his way back to the corner. 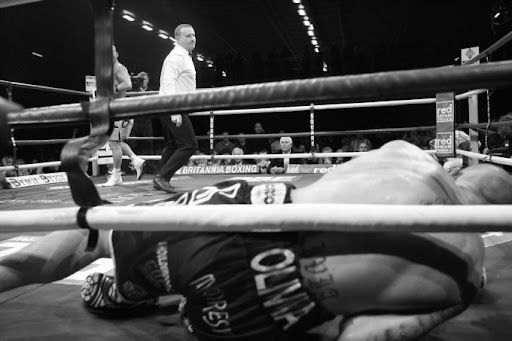 The fifth round saw Rhodes getting dropped to the canvas, but it was a clear low blow that put him there. Despite the roars from the back of the arena, the referee correctly ruled it as a low blow and gave Rhodes the adequate time to recover. The round itself was very close, Moore was still pressing forward but Rhodes was increasingly upping his work rate and was now matching Moore punch for punch. 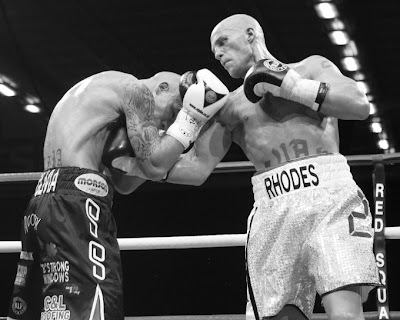 The sixth round was the first clear round that Rhodes won, you could make a case for him in another couple of rounds but this was the round in which he really made his mark. He was catching Moore repeatedly with spiteful body shots and was starting to boss the usually rock solid Salford champion around. To his credit Moore was still trying to force the pace but he was clearly tiring from his efforts in the earlier rounds, the number of heavy whacks to the body he was receiving didn’t help him to much either. Moore tried to re-establish his superiority in the seventh but soon found himself on the canvas after a well timed counter right hook by Rhodes had him in all kinds of trouble. He managed to beat the count but he looked unsteady on his legs. He then, in typical Jamie Moore fashion, decided to go toe-to-toe with Rhodes rather than clinch and buy himself some time to recover. Amazingly he seemed to have turned the tide midway through the round and was once again hurting Rhodes to head and body. Just when it looked as if Moore had weathered the storm and was beginning to break Rhodes heart, he inexplicably dropped his hands and was caught with a monstrous overhand right that sent him staggering backwards towards the ropes. Rhodes jumped on Moore straight away and unleashed a non-stop two fisted salvo that left the referee with no alternative but to stop the fight. It was a remarkable end to a remarkable fight. A lot of credit has to be given to Rhodes, who at 32, showed he still has the appetite to dig deep and come through adversity to win. He’s had a career of many highs and lows but this has got to rank as the most impressive win of it. It’s hard to believe that Moore will be able to rebuild from the defeat, he’ll still be able to compete at European level at either light-middleweight or middleweight but hopes of a world title shot now seem to have gone forever. It’s a shame that his world title dream has fallen apart after so many years of hard work and after spending the past three or four years begging to be given the opportunity he deserved. Bizarrely, despite the fight being billed as a world title eliminator, it now seems that Julio Cesar Chavez Jnr has jumped ahead of Rhodes in the rankings and will fight Sergio Martinez sometime next year. Rhodes will have to be patient, let’s hope he doesn’t have to be as patient as Moore was made to be. 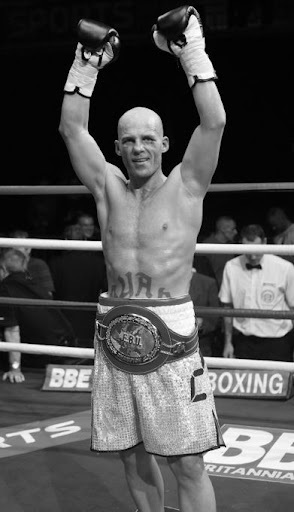 Ian Napa recaptured the British bantamweight title after a close points decision over Gary Davies. A pumped up and emotional Davies started the fight at a furious pace, possibly letting the occasion get the better of him. His work rate was enough to secure him the first two rounds and make the next four close but it was the silky skills of Napa that dominated the fight from there on in. Davies tried his hardest but was being beaten to the punch on the inside and at range. He had to survive some problematic moments late on in the fight as Napa unleashed two powerful uppercuts and numerous left hooks that had him rocking and rolling but he courageously hung on to hear the final bell. Two of the judges had the fight in Napa’s favour (115-114 and 116-112) whilst the third judge scored it as a draw (114-114). I scored the fight 116-112; I felt that Napa’s work was the cleaner in the rounds that were close. Shinny Bayaar produced the performance of his career to capture the British flyweight title after beating Stoke’s Chris Edwards on a split decision. Edwards, who was making the second defence of his title, never seemed to get going. He was unusually negative throughout the fight and only had himself to blame when the scores were announced. The likable Bayaar was the aggressor for most of the fight, and despite not being able to hurt Edwards or get complete control over him, I felt he was the clear winner. Two of the judges scored it in Bayaar’s favour (117-112 and 115-113) whilst the third had Edwards winning 115-113. David Price, the 2008 Olympic bronze medallist, won his third fight in the pro ranks after an uninspiring points decision over Yavor Marinchev. 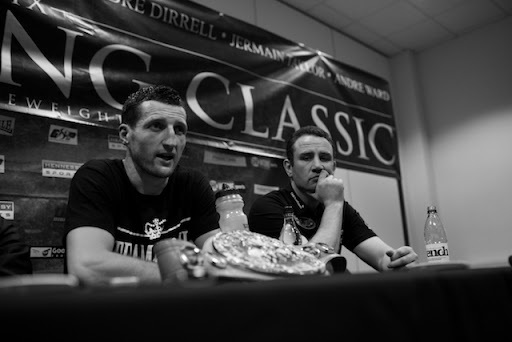 Price controlled the fight from start to finish but looked far from the potential world beater he’s being touted as. Doncaster’s Jason Rushton was rushed to hospital after collapsing in the dressing room shortly after his fight against Brian Rose. Rushton was stopped in the tenth round after a hard fought fight but seemed to be fine initially. He was induced into a controlled coma after scans revealed a small tear to brain tissue. His condition was described as being stable on Sunday and initial signs are good. 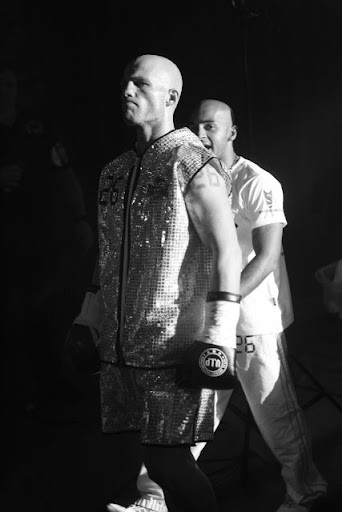 Everyone here at The Boxing Bulletin would like to wish Jason a speedy and full recovery. 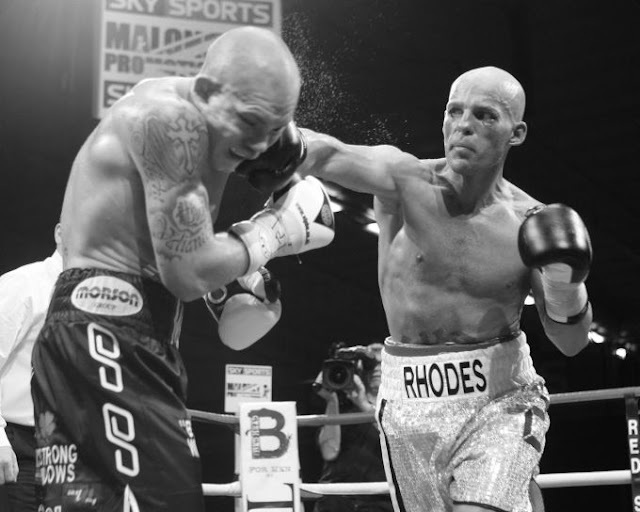 This past Friday at the Bolton Arena, Ryan Rhodes continued his career resurgence with a dramatic 7th round stoppage of world ranked Jamie Moore. 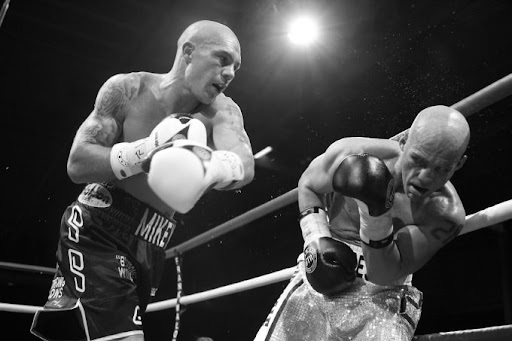 With the victory, Rhodes claimed the European 154 pound title and put himself in the mandatory challenger's position for the WBC junior-middleweight crown held by Sergio Martinez. 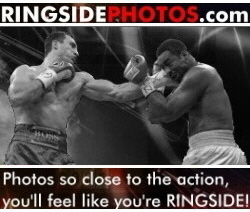 Photographer Chris Royle was ringside to capture all the hard hitting action. Photos © Chris Royle - Click on the images to enlarge. 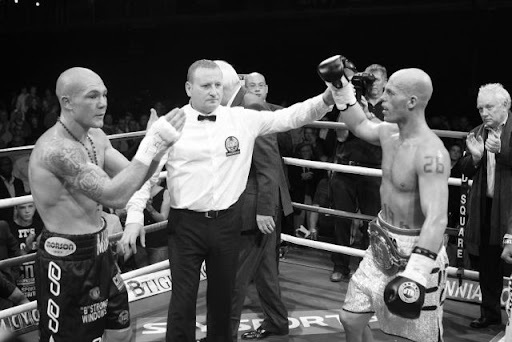 Salford's Jamie Moore (left) entered as the reigning European champion, having captured the belt with a 3 round destruction over Michelle Picirillo earlier this year.The all-action fan favourite brought an 11 bout winning streak into the contest, and an overall record of 32-3. Ryan Rhodes (right), the challenger from Sheffield, also entered on a good run having won his last 7 bouts, reviving a career that until recently appeared destined to fall well short of the promise once shown. As expected, Moore set a fast pace from the opening bell, attempting to overwhelm the challenger with heavy pressure. He succeeded in backing Rhodes up, but the 32 year old used movement and solid counter punching to hang tough in the early going. The intense action was starting to even up by the 3rd and 4th rounds with the bout developing into a give and take battle featuring a number of good exchanges. 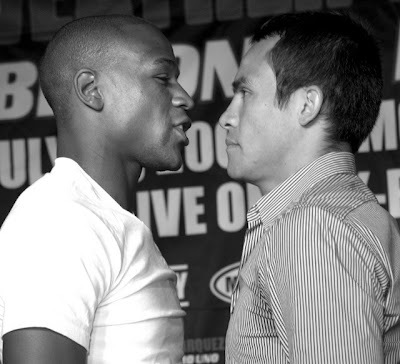 The 4th through 6th rounds were fought at a torrid pace, with both men standing in the middle of the ring and trading. Moore still had a slight edge, but Rhodes had several good moments. Rhodes stunned the crowd by landing a huge right hand early in the 7th. 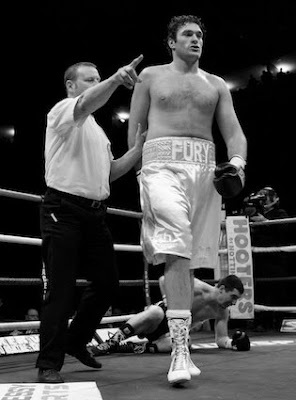 The punch caught Moore flush as he leaned in, sending the favourite crumpling to the canvas along the ropes. Moore quickly found his legs after the knockdown and proceeded to take the fight hard to Rhodes, only to run out of steam in the final minute of the round. 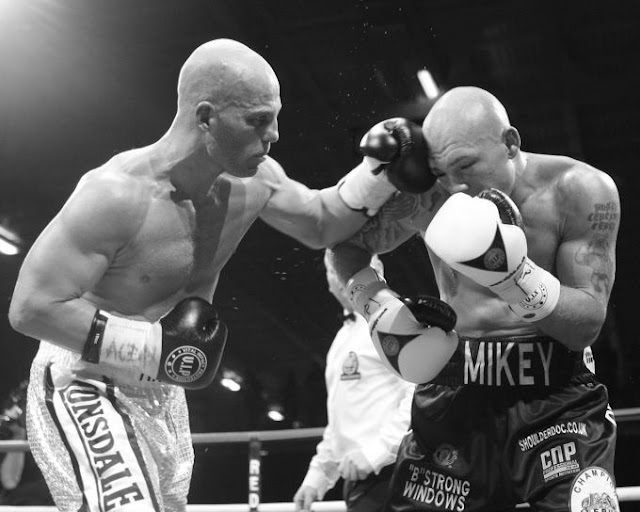 A crunching right hand from the Sheffield fighter sent Moore staggering backwards into the ropes. A follow-up assault left referee Howard Foster with no choice but to jump in with 25 seconds remaining in the round. 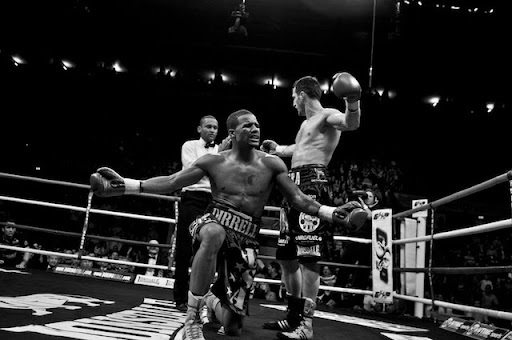 The new European champion, and now mandatory challenger for the WBC 154 title celebrates his stunning victory with his team. As expected, Tomasz Adamek took care of business with a 5th round stoppage of faded former heavyweight contender, Andrew Golota. This one was really all about money, as it's been many years since Golota has shown he can fight at a world class level. 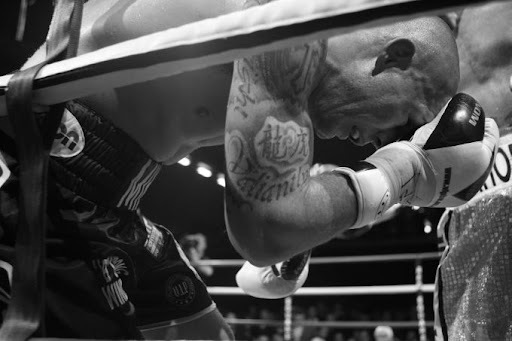 The show took place in Lodz, Poland to maximize profits, and in the end everything worked out nicely for Adamek in his first foray into the heavyweight division. Golota came out unusually fast during the first 3 rounds, probably knowing that he has too many miles - not to mention pounds, as he came in at a career high 256 - to fight the scheduled 12 rounds. To his credit, he did try his best to come forward and land the big one, but it was not to be. He found himself on the canvas in the first, evidence that his legs just aren't what they were. 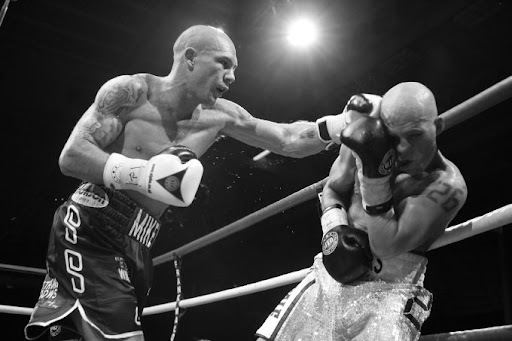 Adamek thrived under the bigger man's pressure and used it to showcase some of his seldom seen boxing skills. This was not the stone-faced terminator who is only looking to line up a short right hand. 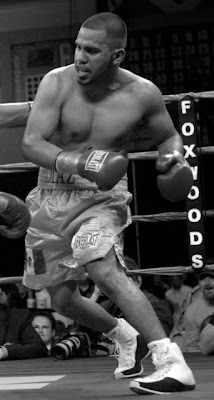 On this night, "Goral" used educated feet to sidestep his opponent's rushes, and swift combination punching to do the damage. 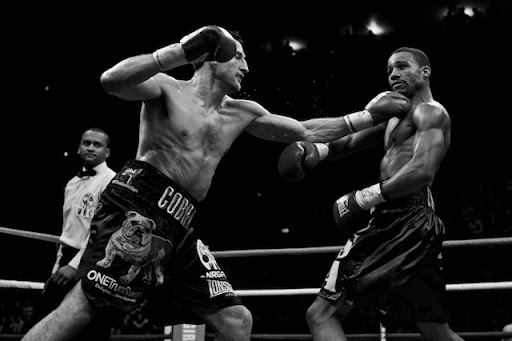 By round 4 Golota was still trying, but had slowed down considerably. He was breathing heavily and his enthusiasm seemed to be sagging. A familiar sight. The end was near. Adamek landed his money punch at the start of round 5, and it sent the old guy to the canvas. 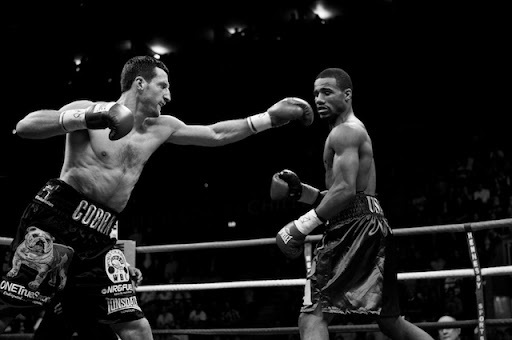 He got up, but was swamped by a world class fighter in his prime. A few more solid shots later and Golota was on skates, prompting referee Bill Clancy to call a halt to the exhibition. With the win, Adamek picks up a ranking in the IBF's top 15 at heavyweight. No one is sure whether he will continue to fight the big guys or if he'll go back down to cruiser to defend his world title. Usually smaller fighters move up because the heavyweights make more money, and no doubt that would be the appeal for Adamek, as potential fights with either of the Klitschko brothers would generate mega-bucks. Is it worth it though? Does Adamek have a realistic chance of even being competitive with the giant Ukrainians, or even one of the smaller top heavies like Alexander Povetkin, David Haye or Eddie Chambers? Given his frame once allowed him to compete at 175, and taking into account that Steve Cunningham had him wobbling badly in the 4th round of their cruiserweight fight, you have to seriously question whether Adamek has the capacity to absorb the kind of fire-power he'll be facing against the big men. To put it bluntly, going in that direction seems like a cash-out, and with the potential to reign for a few more years at cruiserweight, is that a wise idea at this stage? Especially when you consider that Adamek should be able to make some decent money at 200 pounds. He can obviously draw well in his native Poland, but he's also proven himself a big draw at the Prudential Center in New Jersey where his last 3 bouts have done very well. 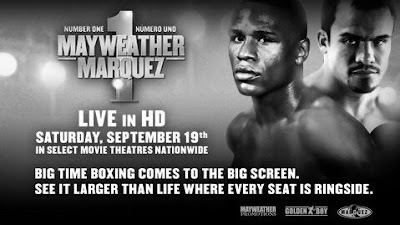 Besides, there are fights below heavyweight that fight fans want to see. A rematch of that incredible fight with Steve Cunningham would be a great place to start. It's an irresistible clash of styles that has already proven to be TV-friendly. Cunningham has been lobbying for a return bout, but in the meantime is settling for a chance to reclaim his belt - vacated by Adamek - against Matt Godfrey. Ola Afolabi is another top guy who could make for an exciting night. Earlier in the year he knocked out Enzo Maccarinelli and will now be taking on undefeated Marco Huck for a title belt. I'm not sure what's going on with the enigmatic Guillermo Jones these days, but that's another potentially violent scrap. Whatever does happen next - it must be worthwhile. After Jonathan Banks, Bobby Gunn and now Andrew Golota, fans are anxiously waiting to see Adamek take on someone they think has a serious chance. e-mail Lee Payton Read more! Dave Oakes previews Friday night's SKY show featuring a 154 pound match-up between European title holder Jamie Moore and challenger Ryan Rhodes. Also on the card are two British title match-ups, with Gary Davis defending his bantamweight crown against Ian Napa and Chris Edwards putting his featherweight belt on the line against challenger Shinny Bayaar. Being called the most entertaining fighter in Britain should be taken as a big compliment but for Salford’s Jamie Moore, it isn’t enough, he feels the time has come to stake a claim for being the best fighter in Britain. He starts this Friday at the Bolton Arena with an intriguing European title defence against former world title challenger Ryan Rhodes, with the winner becoming the mandatory challenger to WBC champion Sergio Martinez. Moore has been desperate to step up to world title level for the past three or four years and is now about to dip his toe into it against the seasoned and dangerous Rhodes. This will be Rhodes (42-4 KO 28) biggest fight since the one year hiatus he took following his defeat to Gary Lockett in the summer of 2006. Rhodes’ career has been one of many ups and downs; he made a blistering start to his career, winning the British light middleweight title in just eleven fights, becoming one of the youngest ever title holders in its history (he’d only just turned 20) before failing in an ambitious attempt at a world title up at middleweight a year later. The decision to move Rhodes up to middleweight so early in his career is one that still leaves me baffled. 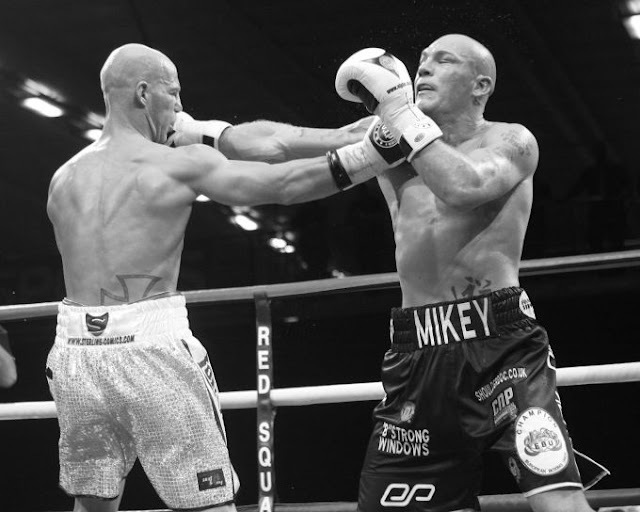 He was finding it hard to make the light-middleweight limit but had been doing so without it taking anything away from him, he certainly wasn’t looking weight drained. I believe his camp thought that Otis Grant was very beatable but that decision backfired when Rhodes was out-pointed by the tough Jamaican. I know that Rhodes himself has said that he moved up because he was struggling to make light-middleweight but you have to question the validity of that statement when you consider he can still make the weight now. The defeat shouldn’t have had a detrimental effect on Rhodes’ career, I’m a great believer in the theory that a loss can sometimes make a fighter. Unfortunately for Rhodes, he suffered another defeat just eighteen months after his first loss, this time for the interim WBO middleweight title. It was in far more brutal fashion though; Jason Matthews knocked him out inside two rounds and almost destroyed Rhodes’ career. A less than focused Rhodes then treaded water for years, facing journeymen opponents and failing to live up to the reputation he’d made when claiming the British title at such a young age. Even another shock knockout defeat wasn’t enough to fire him up; he looked totally disinterested with the sport when Lee Blundell stopped him in the third round of a fight in which Rhodes should’ve won with ease. The turning point in Rhodes’ career came after his last defeat, a points loss against Gary Lockett just over three years ago. Rhodes seemed to be regaining his hunger in the four fights he had before facing Lockett but I sensed he rediscovered his confidence after running Lockett close on the scorecards. It was almost as if he realised that he could still be a champion if he fully dedicated himself again. He regained his British title in 2008, nearly 12 years after first winning it, destroying Gary Woolcombe in brutal fashion. Woolcombe was the defending champion and the betting favourite going into the fight but Rhodes out-boxed him before producing a spectacular finish, knocking him clean out in the ninth round. The victory has definitely been the best performance of the second part of his career; he followed it up with good victories against Jamie Coyle and Vincent Vuma, as well as a routine knockout win over Janos Petrovics in his last fight to confirm that he’s back to his best. Moore is also no stranger to the ups and downs of professional boxing, he’s suffered three defeats in his career (32-3 KO23) but has comeback from them well each time. 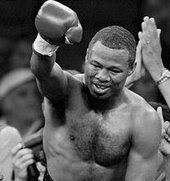 It has to be said that his disqualification loss to Michael Jones was very debatable (Moore has two wins over Jones as well as the defeat), and the knockout defeat to Ossie Duran was as much to do with a hip injury rather than any punch Duran landed. Everyone in Britain knows Moore as being an all action fighter but I feel his technical ability is often overlooked because of his aggressive style. 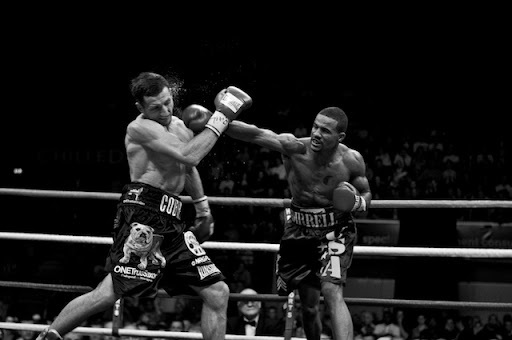 The way he was catching and rolling away from punches in his war with Matthew Macklin was very impressive. 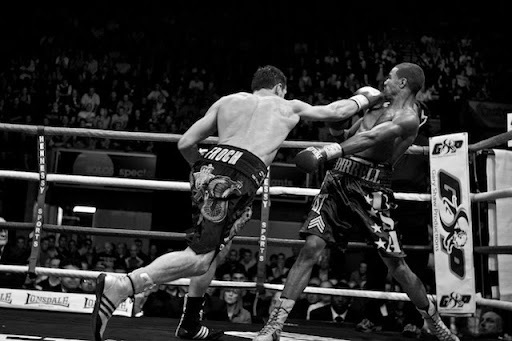 He boxed clever as well as trading heavy punches that night and the victory looks even more impressive now that Macklin has become a European champion himself. Moore has been looking sensational of late, respected European level fighters Roman Dzuman and Michele Piccirillo were both blown away early, neither of them being able to match Moore’s strength and aggression. Moore looks massive for the weight and seems to be hitting harder than ever, he’s certainly showed that he’s now well above European level and should be confident of winning a world title if he comes through on Friday night. There’s no doubt that Rhodes will be the hardest test of Moore’s career, his switch-hitting style could cause Moore some problems and he has a wealth of experience to draw from. Despite the knockout defeats on their records, both fighters have solid chins, both also have respectable punch power and both firmly believe they’ve got the beating of each other. It has all the makings of a very good fight. I can see Rhodes being very cagey early on, looking to counterpunch Moore rather than trading with him. Moore will be made to work hard to land clean punches but I think his size, strength and body punching will eventually take its toll on Rhodes. I wouldn’t be surprised if it went the distance but I’ve got a feeling that Moore will want to make a statement and stop him. I think Moore will have to be on top form to do so but I believe he’ll get a late stoppage win. The undercard sees two British title fights. Gary Davies defends his bantamweight title against Ian Napa, whilst Chris Edwards defends his flyweight title against Shinny Bayaar. The fight between Davies and Napa should be an entertaining fight. The improving Davies is coming in off the back of two impressive victories, his second round destruction of Martin Power and his seventh round stoppage of Matthew Edmonds. Davies is an aggressive boxer who hits very hard; he also has considerable height, reach and strength advantages over Napa. This won’t be anything unusual for the diminutive Napa but he must improve on his last outing if he wants to regain the British title he vacated a couple of years ago. 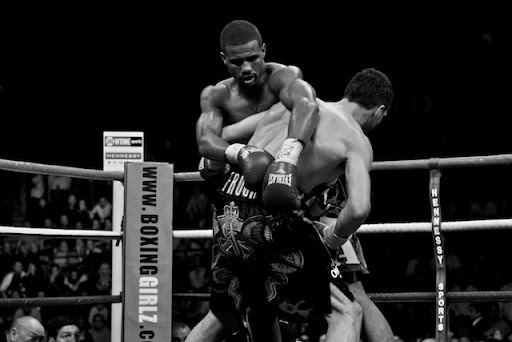 Napa looked like a fighter on the slide last time out when he lost his European title to Malik Bouziane. He didn’t have an answer to anything Bouziane did and allowed himself to be outworked on his way to a wide points defeat. It could be that Napa just had a bad day at the office and will be back to form in this fight, but one thing is for certain, if he loses this fight, he won’t have many options left afterwards and would have to consider hanging his gloves up. I think that could spur Napa on to victory, he’ll be determined to erase the memory of the Bouziane performance from his mind. Napa has always relied on his speed and skills; if he is on the slide then it could prove to be a very hard fight for him because Davies won’t take a backwards step all night. If Napa’s still got something left in the tank, which I believe he has, I think he should be able to outbox Davies to win on points. Chris Edwards v Shinny Bayaar is an interesting match up. Bayaar has been disappointing so far in his career, losing four times in eighteen fights, usually when he’s tried to step up in class. He’s a hard fighter who looks to have a rock solid chin but unfortunately he doesn’t have much else in his arsenal. Edwards is a much better fighter than his record (13-13-3) suggests but is no world beater by any stretch of the imagination. He likes to swarm all over his opponents, trying to grind them down with body shots. He doesn’t punch particularly hard but can sicken opponents with his relentless attacks. I think this fight will undoubtedly go the distance, the early rounds will be close but Edwards’ better fitness and hunger will help win the late rounds to take a wide points decision. 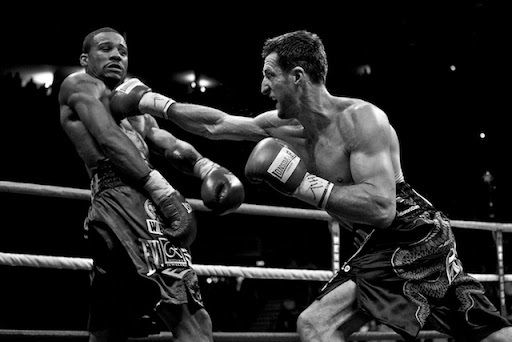 Last Saturday night in Nottingham, battle tested British super-middleweight Carl Froch took on American speedster Andre Dirrell in the first round of Showtime's Super Six World Boxing Classic. Photographer Justin McKie was ringside at the Trent FM Arena to capture all the action from the much anticipated super-middleweight clash. Photos © Justin McKie - Click on the images to enlarge. 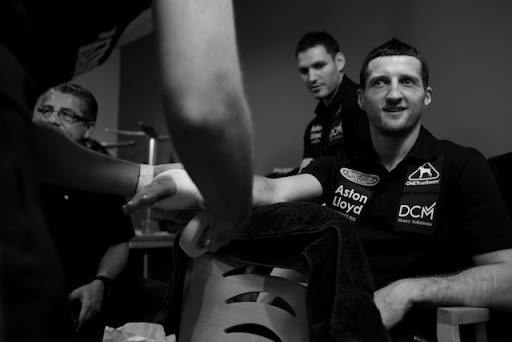 Carl Froch arrives at the Trent FM Arena in Nottingham - the scene of his memorable 12 round victory over Canadian Jean Pascal last December. 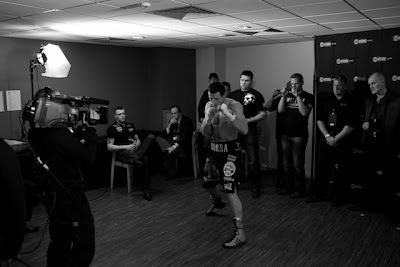 From wrapping the hands, to getting warmed up, trainer Rob McCracken prepares his fighter for a hard night's work. 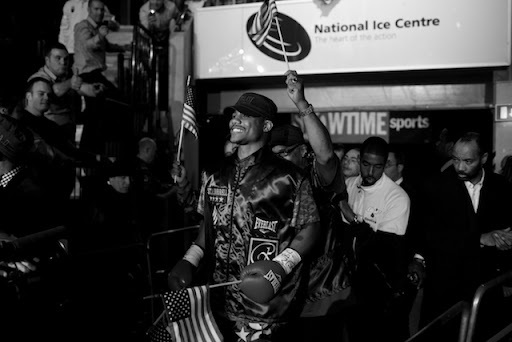 Fighting on foreign soil for the first time as a professional, Andre Dirrell looks relaxed and confident as he makes his way to the ring. The 26 year old from Flint, Michigan, brought a perfect 18-0 record into the contest. 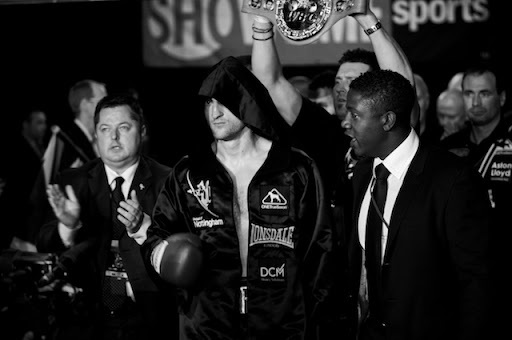 With the clock already past 2 AM local time and the crowd eager for action, Froch makes his entrance. The hometown fighter is coming off his two biggest victories - a unanimous decision over Jean Pascal and a last minute stoppage of Jermain Taylor - and sports a perfect record of 25-0. 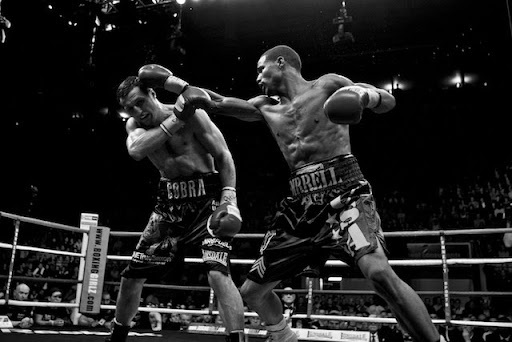 The early rounds were fought mostly at long range, with Froch edging forward and the switching hitting Dirrell using his jab from both the conventional and southpaw stance to stay at long range. 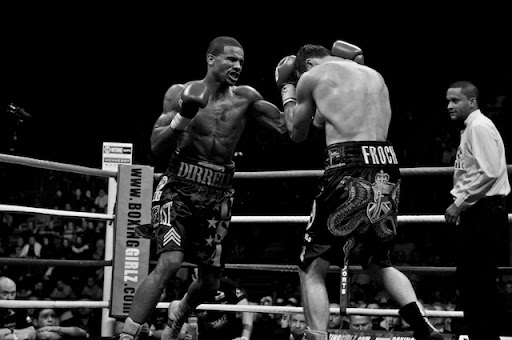 Dirrell also mixed in plenty of movement, avoiding much of Froch's early attacks with his fast feet and quick reflexes. The action intensified in the 3rd and 4th round, with Froch upping the pressure, but still having a hard time catching up with the speedy American. The action started to get a little messy as the bout moved into the mid rounds. 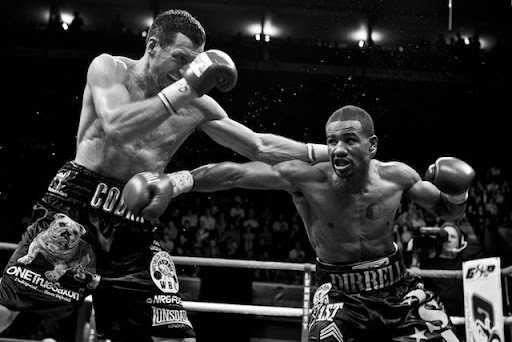 The fighters often came together awkwardly, with Dirrell slipping to the canvas more than once. Both men were guilty of numerous infractions in what was becoming an increasingly untidy fight. 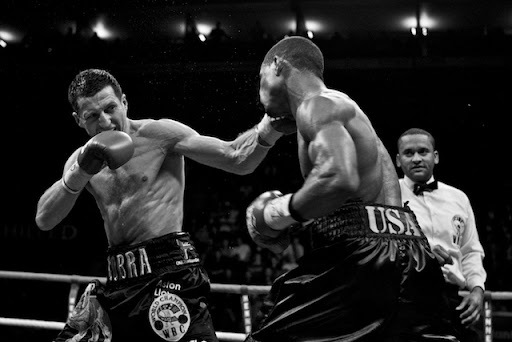 Froch was cautioned on more than one occasion for hitting behind the head, while referee Hector Afu was forced to warn Dirrell several times for holding. Eventually Afu took a point from the American for excessive holding. 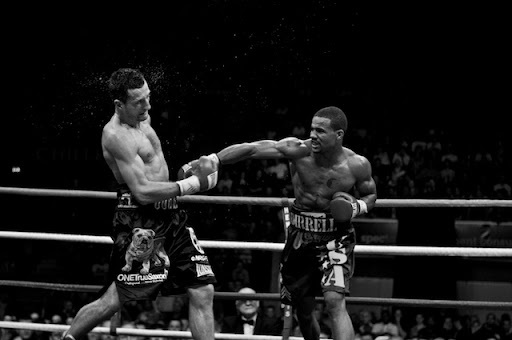 Boasting a significant edge in hand speed, Dirrell often beat Froch to the punch when he lets his hands go. 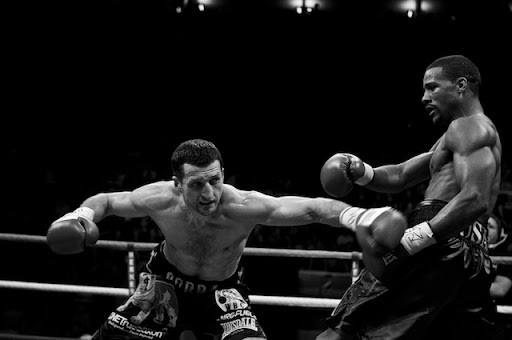 Above - Referee Afu looks on as Froch lands a hard left hook. 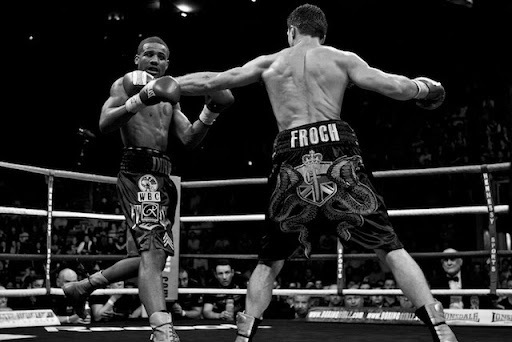 Froch had many of his best moments during the second half of the fight, with Dirrell occasionally looking rattled by the pressure. 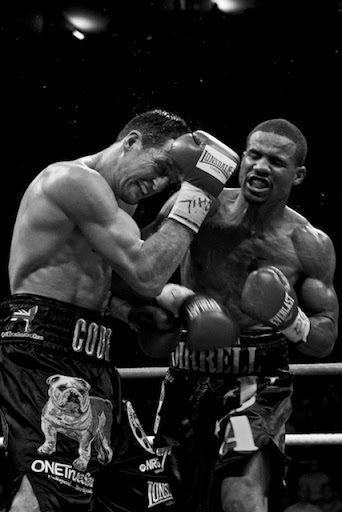 After struggling through rounds 6-9, Dirrell came to life at the end of round 10 and closed strong over the final two frames. 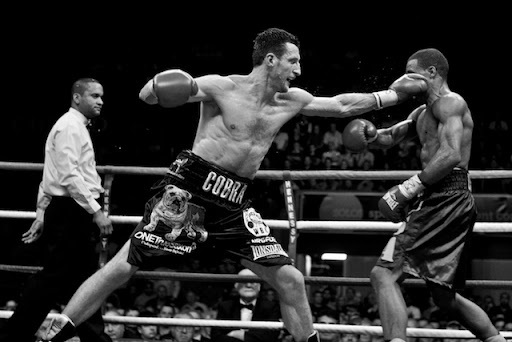 Below he lands a hard left hand between Froch's guard. After 12 hard fought rounds, the decision was as contentious as the action, with the judges disagreeing on the winner. Judge Alejandro Rochin Mapula scored it 114-113 for Dirrell, but was overruled by judge's Massimo Barrovecchio and Daniel Van de Wiele, who both had Froch in front by 115-112 scores. Next up for Froch will be a trip to Denmark to face perhaps the most complete fighter in the tournament, Mikkel Kessler. 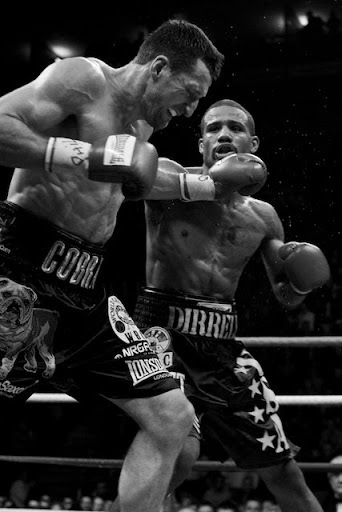 Dirrell has his work cut out as well, as he'll be going up against Germany's heavy handed Arthur Abraham. The post-fight press conference. 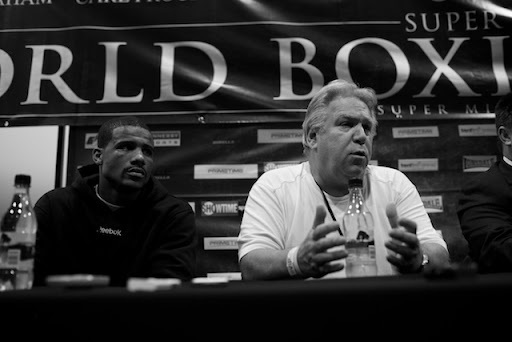 Dirrell is seated with promoter Gary Shaw, while Froch is accompanied by Rob McCracken. 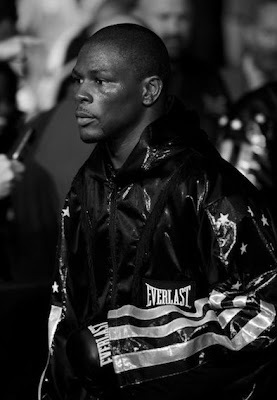 Can Jermain Taylor Upset Arthur Abraham?